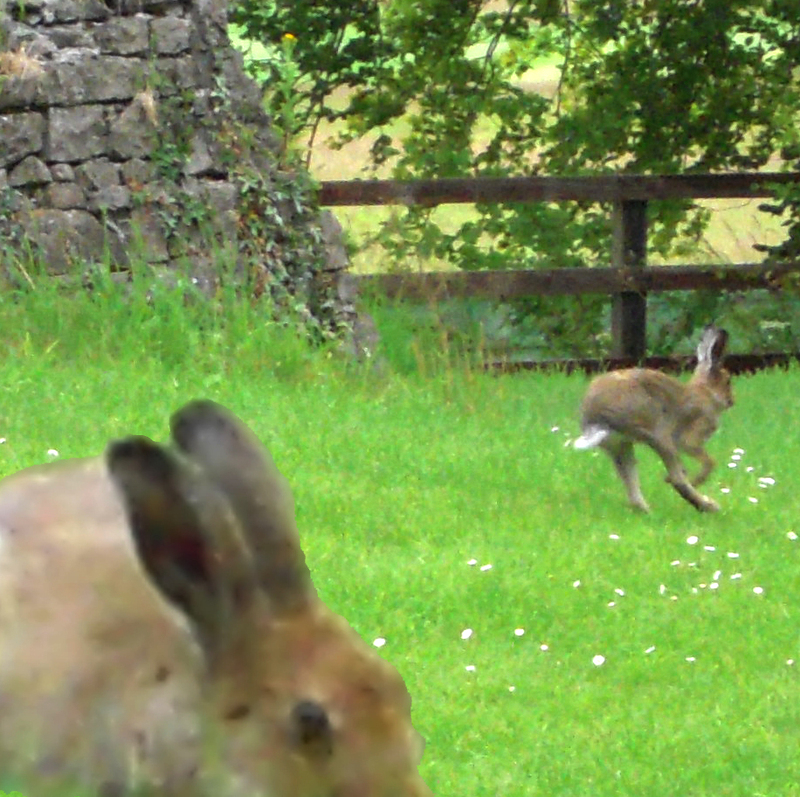 The Irish Hare – Lepus timidus Hibernicus – sometimes confused with the Mountain Hare – Lepus timidus Scoticus – which is smaller, Scottish, and has a lighter, winter coat, is not an unusual sight for the careful watcher in West Cork. Sightings of groups of two or more are frequent enough, in fact, to cause us to question the old folklore that says that Hares are always solitary: I once saw eight Hares running in a cluster across the field next to Danny’s house. But the story goes that the female Hare escaped from the Ark and was drowned, so God gave the male Hare the power to bear children: country people recounted that the Hare is androgynous – even as recently as the twentieth century – and lives in complete isolation, without the need for a mate. Hares walked our Earth a million years before humans did – and have changed very little in that time: a true archetype. 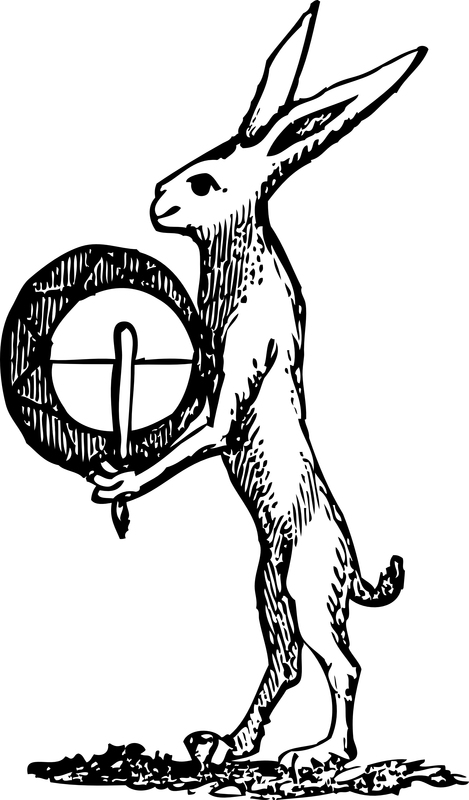 This could explain why the Hare is such a central figure in so many mythologies: trickster, moongazer, mischief-maker… In one pan–African story, the Moon sends Hare, her divine messenger, down to earth to give mankind the gift of immortality. “Tell them,” she says, “that just as the Moon dies and rises again, so shall you.” But Hare, in the role of trickster buffoon, manages to get the message wrong, bestowing mortality instead and bringing death to the human world. The Moon is so angry, she beats Hare with a stick, splitting his lip – as it remains today. I watch the pair: they are aware of me – but I’m no threat. Two West Cork fields lie between them and me… small fields, perhaps, but they know very well that they could vanish before I even made the gate. When I first saw the movement I thought it was partridge: I made it out to be two female heads in the long grass. Then I realised – ears laid low, then up and turning. They are all to do with the head: those so defining ears; the nose; the liquid, fathomless eyes – never closed, even in sleep. All the senses, and always at the ready… And – if they had to take off – that confounding sense of dizziness that sends them in impossible zigzags – even doubling back – to confuse their far less intelligent pursuers. They will also leap – up to twelve feet in one bound – to avoid laying a scent. But – if you can – look further into those eyes: the depth, the perfect attuning, the knowledge… These are not animals for the jug – these are creatures we are privileged to share the Earth’s gifts with: these are the Old Gods. This entry was posted in Folklore, Wildlife and tagged Hares, Mythology. Bookmark the permalink. Great post, Robert! Congratulations to you and Finola on Roaringwater Journal.